A healthy coral reef on Millennium Atoll, Southern Line Islands. : Image credit: Brian Zgliczynski,But coral populations are threatened by a multitude of local and global stressors. Rising ocean temperatures are disrupting the 210m-year-old symbiosis between corals and microscopic algae. When temperatures rise, the coral animal becomes stressed and expels its algal partners, in a process known as coral bleaching. These symbiotic algae are a critical food resource for corals, and without them corals lose their primary source of nutrition. Fortunately, corals are mixotrophs and not solely dependent on nutrition from their algal partners. Despite their sedentary appearance, corals are voracious predators capable of capturing a wide variety of prey using their tentacles and mucous nets. Knowing how much corals eat via predation is essential for understanding how they can persist in a warming ocean. Numerous laboratory studies have shown that if coral feed, they are more capable of surviving the stress associated with warming temperatures and decreasing pH levels. Feeding can also increase the reproductive capacity of corals, which is key to repopulating reefs that have suffered high levels of coral mortality. Yet, almost 90 years since one of the first published accounts of coral predation, we still do not know much about how coral feeding varies as a function of food availability in the wild. However, our new study sheds light on this longstanding question. We combined field sampling with global satellite measurements and published data to reveal that corals respond to how much food is on their reef. This indicates that corals living in more productive (food-rich) waters consume more food, which changes our understanding of how corals survive and may aid in predictions of coral recovery in the face of climate change. Studying variation in the diets of corals over large areas is no easy task. To determine if corals will change their feeding behaviour as a function of food availability, we sailed to the remote Southern Line Islands of Kiribati. These islands are ideal for studying variations in coral diets because they lack local direct human impacts (fishing and pollution) and are situated across a natural gradient of food availability fuelled by equatorial upwelling. This process delivers colder, nutrient- and plankton-rich waters to the surface ocean along the equator in the central Pacific. We examined coral diets across five islands using stable isotope analysis. Stable isotopes are atoms of the same element (in this case carbon) that differ in mass due to the number of neutrons in their nucleus. This subtle mass difference allows scientists to determine what an organism is eating based on how similar the isotopic composition of the consumer (coral) is to its food (zooplankton). 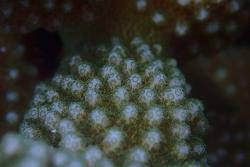 The individual polyps of Pocillopora meandrina, which feed by capturing prey with tentacles. 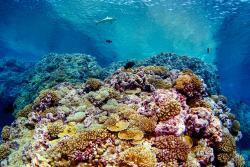 : Image credit: Michael D. FoxThe isotopic data showed that the corals on the more food-rich islands were capturing and consuming more planktonic prey than corals on islands with lower food availability. These findings suggested that the abundance of food might be important for corals in other locations, which inspired our team to evaluate if coral feeding habits can be used to track global food availability. Satellites can reliably measure the amount of phytoplankton around tropical islands – a useful proxy for estimating food abundance for corals. So, using satellite data from 2004-2015, taken from 16 locations spanning the Pacific and Indian Oceans to the Red Sea and the Caribbean, we compared published isotopic values from corals at each location. What we found was a striking relationship between the chlorophyll content of the water and the feeding habits of corals. Essentially, corals in more productive regions consume more planktonic food. Can well-fed corals survive the heat? The seemingly simple observation that corals eat more where there is more food has important implications for our understanding of how coral reefs function. It underscores the importance of the physical environment around reefs and suggests that food availability may be an overlooked driver of coral recovery potential. The capacity for corals to feed before or during thermal stress can improve their capacity for survival. These findings lay the foundation to begin investigating the possibility that reefs in more naturally food-rich waters have a greater capacity to resist or recover from disturbance events such as thermally induced bleaching. Reefs do show variations in how they respond to thermal stress events – some reefs bleach less than others – but the exact mechanisms behind these differences remain largely unclear. The relationship between coral feeding and ocean chlorophyll established in this study offers a roadmap to locating potentially more resilient coral reefs around the world. Such knowledge does not replace the need to urgently reduce greenhouse gas emissions and protect coral reefs from the increasing frequency of ocean warming events, however. Instead it should be used to guide strategic management actions in the inevitable interim.